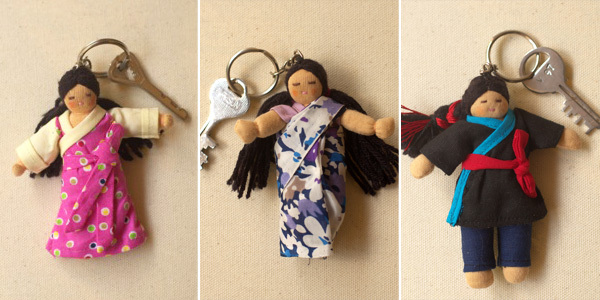 We are making three different styles of key chain dolls, which you can also order as bag clips.They make a beautiful small gift and will be a great accessory to a child’s bag, pram or baby carrier. All wear traditional clothing which is securely attached to their bodies and you can choose between a Tibetan girl, boy or the saree clad Indian girl. The dolls are filled with 100% sheep wool and the facial features are carefully hand embroidered. Please note: While maintaining a distinct style, due to its handcrafted nature, each product will vary slightly and fabrics used for the garments are frequently changed. If you have any preferences for colours or choose between bag clip or key chain, ​please contact us via email atinfo@dolls4tibet.com.